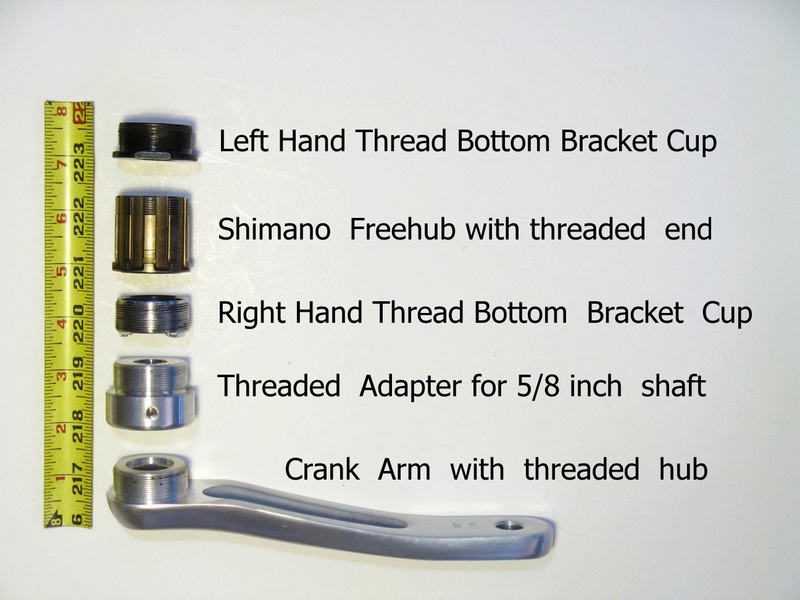 The threaded right crank arm allows a freewheel to fit in the small space. A reverse rotation freewheel is usually needed for the second freewheel for the motor connection or it will unscrew, and unfortunately these must be adapted from single speed freewheels as there aren't any flanged units. 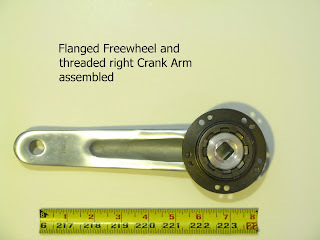 Bearings that have either sprags or ramps in them will spin in only one direction, and can be used in place of a freewheel. Since the motor speed needs to be slowed down, a planetary gear set built with a one way bearing is very tempting. 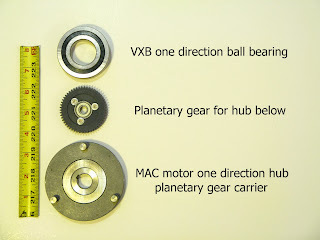 However there are problems with the inside bore diameter fitting around the crank bearings, and also with enclosing the gear assembly, which makes this a more serious solution for someone willing to build a case and/or custom large diameter one way clutch. 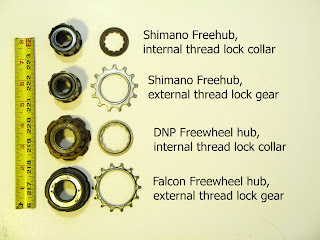 I've also collected a few freewheel hubs and freehubs, just in case it looks like a lay shaft would be the best fit. They would have a problem fitting down in the crank area. 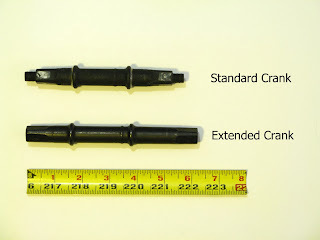 Adapters that could hold the one way devices. 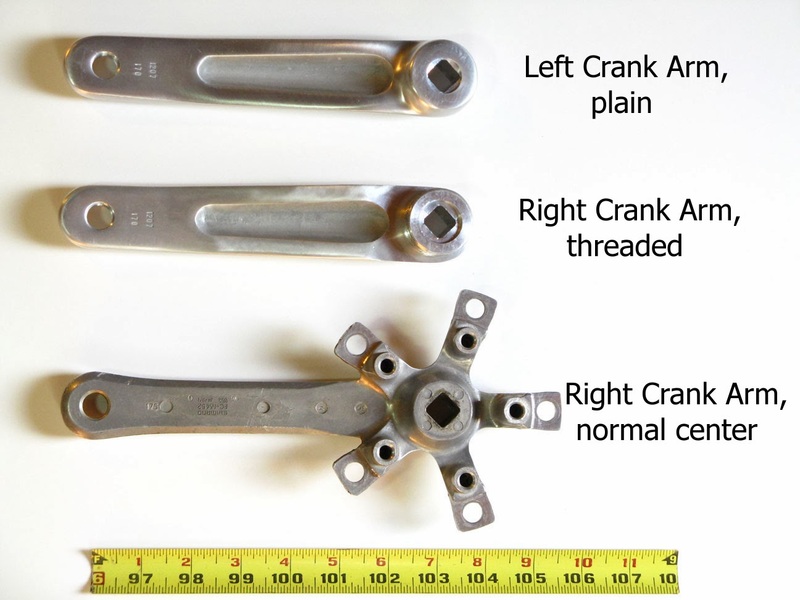 A crank with an extended right side to allow more stuff to fit between the pedals. 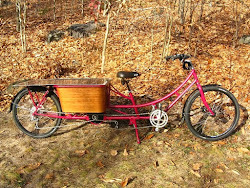 There were two freewheels that didn't do well. The second flanged DNP is new and I'm not sure what is going on, as the other one has much lower drag. 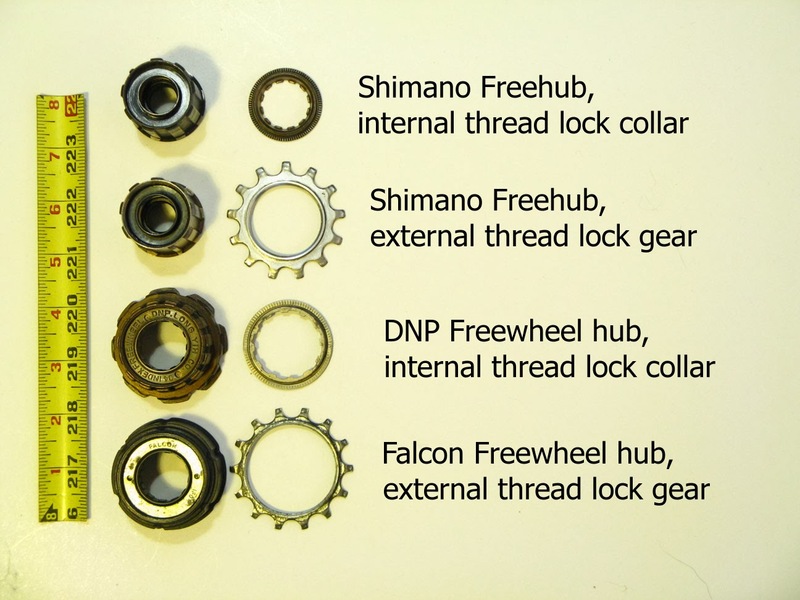 The Shimano freehub probably has some very old and dirty lubricant inside, maybe even rust, so I don't feel it is representative, just an example of what bad maintenance will do. 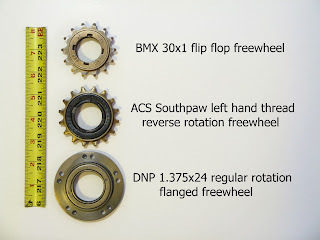 The best choice appears to be freewheels, but it should be noted that these are all very small amounts. The lowest plain shielded bearings cause a drag when riding that is equivalent to lifting 0.002 ounce- not even noticeable, and the worst case dirty hub is only 0.4 ounce drag, which is similar to lifting two pencils. 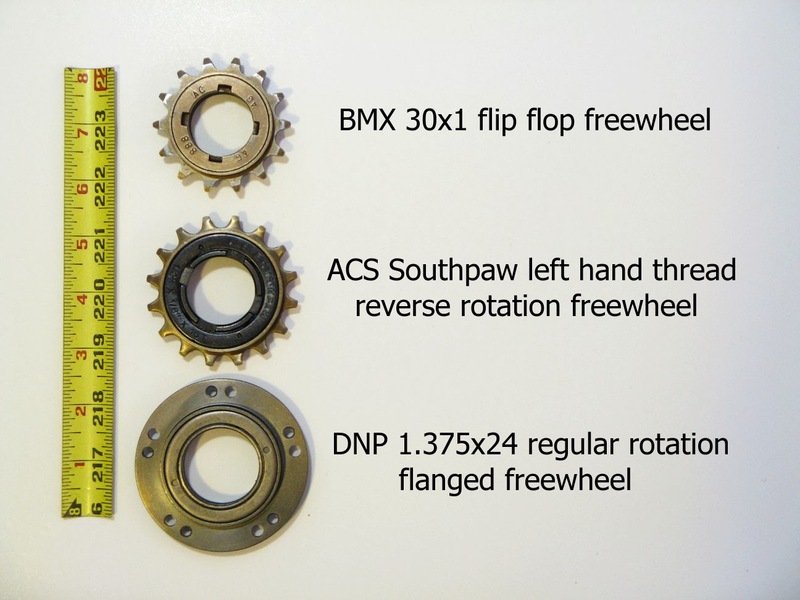 If a bike was never maintained it might be possible for the front and rear wheel bearings, and the crank bearings to have that much drag also. 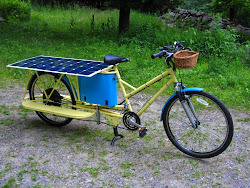 The bike would be only a little bit less rideable. The point here is to avoid adding many more bearings while building a mid drive, because maintenance can not be guaranteed.